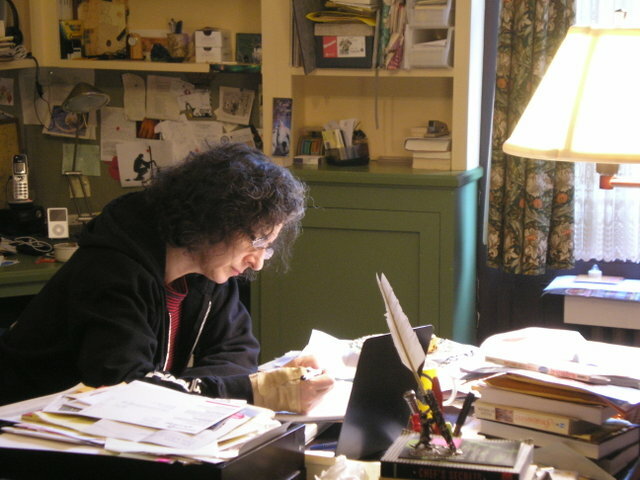 Ellen Kushner’s writing ranges from award-winning novels to works for the theater, audio drama, and short fiction for both children and adults. Ellen Kushner burst on the scene with her genre-defying first novel, Swordspoint: A Melodrama of Manners, in 1987. It has become a cult book that some credit with sparking the “fantasy of manners” (or mannerpunk!) school. She returned to the same setting in The Fall of the Kings (written with Delia Sherman) and The Privilege of the Sword, and a growing number of short stories, sometimes known as the “Riverside Series.” In addition, 2015 saw the launch of Tremontaine, a collaborative online series set a few years before Swordspoint. She turned to the world of myth, music and folklore in her second novel, Thomas the Rhymer, which swept both the Mythopoeic and the World Fantasy Awards. In short fiction, Kushner was one of the original authors in Terri Windling’s groundbreaking “Bordertown” shared world urban fantasy series. In 2011 she initiated a YA revival of the series Welcome to Bordertown co-edited with Holly Black. Her work for children includes The Golden Dreydl, which she adapted for New York’s Vital Theater as The Klezmer Nutcracker. Other writing for the stage includes two one-woman musical shows, and she co-wrote the audio drama The Witches of Lublin for public radio. Some of her poetry can be found online at the Endicott Studio. And, yes, she is the same Ellen Kushner who wrote some of those Choose-Your-Own-Adventure books you find in misty memories or garage sales.